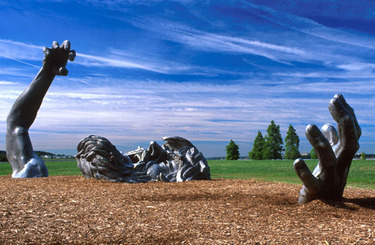 The Awakening is a huge, multi-part sculpture that was installed in Washington DC's East Potomac Park by artist J. Seward Johnson in 1980. 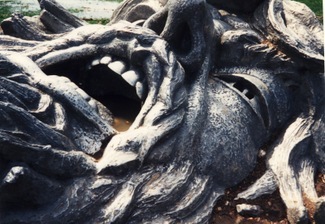 No doubt, it was one of the most ambitious works featured in that years' International Sculpture Conference Exhibition. Observed from a modest distance, it creates the visual impression of a partially buried giant, struggling to free itself from the Earth. I took this photo (left) of the giant's face during a 1993 roadtrip to our nation's capital and have had it stuck to my refrigerator with a magnet for many of the ensuing years. You need to see the piece's other components in order to get the proper perspective, but since all of my other pictures taken on that day include me with the dreaded "90s hair", other people's shots on Flickr will have to suffice. And there are a lot to choose from. The Awakening's entry on Wikipedia has more info, including the amusing fact that the sculpture "proved so popular... that 27 years after the event, it still remains, even though the National Park Service admits that the "temporary permit" has long since expired". Sadly, it seems that the work's long and glorious run at Hains Point is coming to a close: The Park Service recently announced that the immense statue is being relocated to Prince George's County (Maryland), beginning tomorrow, February 20th. No word on whether or not there will be a candlelight vigil this evening, but if you happen to be in DC today, be sure to seize upon your last chance to see this truly arresting work as the artist intended. I remember climbing into his mouth when I was young. You should include some pictures of that! I'm not sure, but I believe its new location is barely a couple miles downriver and still in public view. The right arm of this sculpture is featured on either the cover or inner sleeve of one of the two Marginal Man albums I ended up selling to cover for my deadbeat roommate's rent in my first apartment. Secret of being a deadbeat roommate -- make sure you're on the lease and a good 5 years older than the rest of the people in the apartment. Also if you are going to be a deadbeat roommate it helps to establish a 'mean of reciprocity' before actually you actually renege on the rent. For example if you have an argument with your girlfriend be sure and punch a hole in sheetrock. The heavy lifting is then convincing your cohabitants to chip in to repair said hole. There are numerous ways to approach this kind of persuasion, which are beyond the scope of this post-consult your local library. Once you can achieve this, and assuming your name is on the lease and you are 5-10 years older then your roommates, you can be assured of free rent until you succeed in getting everyone evicted. @bartleby - ya beat me to it. It was in fact on the inside of the Identity album, by Marginal Man. I just saw this for the first time a couple of months ago. The Awakening is featured in TV John Langworthy's award winning music video, "Memories, Oh Memories"! Which is more monstrous, the giant's pained expression or TV John's gargantuan hands? earn the money to buy it themselves?